Supply routes for much-needed water, food, medicine, clothing, fuel and other commodities were almost nonexistent, particularly in the Caribbean. How could these regions be helped when the outside world didn’t know what critical supplies were needed most? Many companies and government agencies rushed to help. Reestablishment of communications to these areas became crucial to redefining the supply routes. One company, in particular, was one of first responders to make this happen — GLOBECOMM. 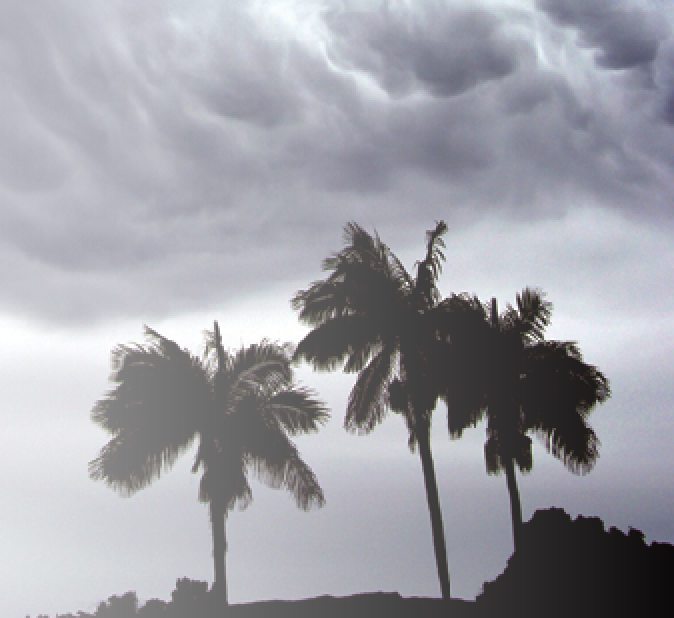 GLOBECOMM has been a leading supplier of disaster recovery products and services for decades. Recently, after Hurricane Maria in Puerto Rico, GLOBECOMM partnered with Vanu to start the process of reestablishing communications across the island. This was accomplished with a small cellular base station made by Vanu covering about a three mile radius. The base station is plugged into a satellite dish installed by GLOBECOMM that connects back to a soft switch located at GLOBECOMM’s New York headquarters facility. The soft switch then connects to local carriers, providing much-needed cell service to the population. The response was phenomenal; cell phones started ringing like a flash mob concert. The GLOBECOMM soft switch was established at GLOBECOMM in 2010 to provide small carriers in remote locations with an economical way to start their business without the initial expense of the switch. The soft switch was shared among small businesses as their customer bases grew. The added benefits of versatility and economics have shown the service to be an important part of any disaster recovery response. GLOBECOMM’s excellent capabilities are a result of close cooperation with additional companies and government agencies to expediently react to any disaster. Another example is GLOBECOMM’s efforts to support a government disaster response agency. Figure 1. GLOBECOMM’s soft switch adds benefits of versatility and economics for Disaster Recovery response. GLOBECOMM maintains an operations center in the Washington, D.C., area that supports the warehousing and deployment of IT and communications technologies and assets utilized during disaster response. GLOBECOMM also has staff deployed in the contiguous states, as well as outside the continental United States, providing additional support, including technology refresh and upgrades as well as quick deployment anywhere. When a disaster occurs, GLOBECOMM submits a detailed plan that addresses infrastructure, existing/available communications, available power and/or limitations, primary and secondary means of communications, transportation, security, contact lists, and billeting. The company’s field team has valid passports, up-to-date immunizations, required training and can deploy within four hours.During the 2017 hurricane season, GLOBECOMM sent engineers and/or equipment to Barbados, Haiti, the Bahamas, Antigua and Barbuda, Saint Maarten, Curacao, Dominica and Guadeloupe. GLOBECOMM’s support efforts extend beyond disaster recovery. 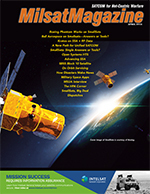 With the flexibility of satellite communications, the company’s products and services are used in a variety of circumstances and have been selected time after time to design and implement enterprise and morale, welfare and recreation (MWR) networks for the nation’s armed forces as well as for the U.S. government foreign affairs community. The GLOBECOMM global network of satellite and fiber allows us to provide remote connectivity, anytime, anywhere under any conditions. GLOBECOMM supports physical and logical Internet Protocol (IP)-based global networks that government enterprises domestic and abroad, as well as MWR networks, have implemented for personnel to keep in contact with their friends and families. Supply operations in the Caribbean. Photos are courtesy of GLOBECOMM. 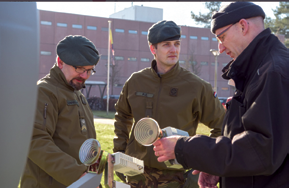 Recently, GLOBECOMM’s European arm delivered two 1.2m SATCOM antenna systems, including iDirect X7 modems, outdoor GPS, Cisco ATAs and telephones, to the 43rd Mechanized Brigade of the Royal Netherlands Army. The systems are used in the field at remote locations where the brigade has no other means of operating its SAP software system, which is necessary for ordering spare parts for the equipment maintained by the 43rd Maintenance Company. 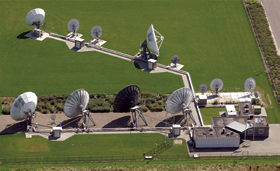 The firm’s VSAT service supports connectivity back to headquarters. 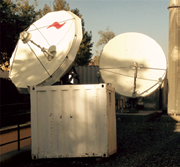 GLOBECOMM VSAT Service has been designed to furnish reliable, cost-effective connectivity services between users across the globe. This may entail connecting remotely situated users, systems to a corporate network for business or M2M purposes, to the internet for work or entertainment, or any combination of these. The ability to support land-based users and mobility and beam switching for maritime and aeronautical users are key attributes of the service platform. Photo of the GLOBECOMM teleport in the Nethrlands is courtesy of the company. 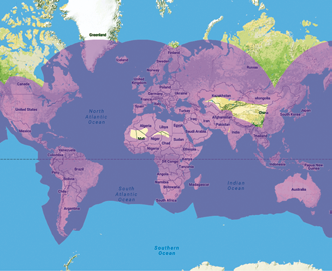 GLOBECOMM VSAT coverage to remotely situated users is achieved via satellite communications (SATCOM) using 24 Ku-band beams generated by 17 satellites that are accessed from nine worldwide teleports, three of which are owned by GLOBECOMM. The beams are depicted in Figure 2 on the previous page. The GLOBECOMM International Network (GIN) links these and an additional five teleports with a carrier-diverse gigabit Ethernet SONET/SDH network. The GIN interconnects the teleports and provides peering points at 10 international carrier hotels. These peering points may be readily accessed by GLOBECOMM VSAT customers to achieve connection to their WANs using local loop services. Thus, global SATCOM and fiber connectivity allow us to connect remote users anywhere in the world to their enterprise WANs or to the public internet. 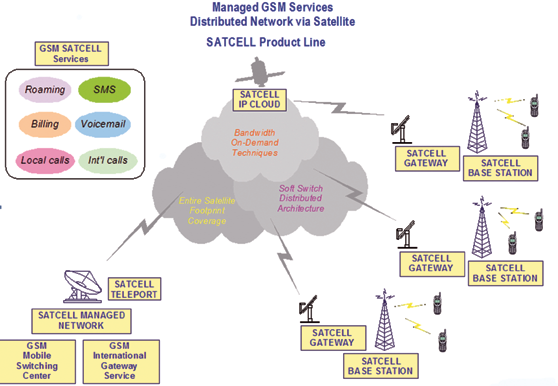 The company’s VSAT service was commercially launched in October 2015. Precise coverage for any individual site will vary based on user terminal size, BUC power level, user data requirements, and look angle available based on user location. The significant hub architecture investment made by GLOBECOMM provides ample capacity for growth and expansion of additional networks. • U.S. Federal Law Enforcement Agency: GLOBECOMM supports one of the world’s largest law enforcement organizations that is charged with keeping terrorists and their weapons out of the U.S. while facilitating lawful international travel and trade. As such, it has an extensive communications network and GLOBECOMM provides a satellite network that backs up the terrestrial network. • U.S. Federal Aviation Agency (FAA): The FAA controls the U.S. airspace that facilitates the safe and orderly movement of more than two million air travelers each day. This control requires an extremely complex and expansive communications network that necessitates high reliability and availability. As such, the primary terrestrial network is backed up with a satellite network that GLOBECOMM provides and supports via a subcontract to the Harris Corporation. On-the-job training for the Royal Netherlands Army. Photo courtesy of GLOBECOMM. • Dutch Ministry of Defence: The Dutch military has always been good at global citizens and dispatching its military personnel throughout various parts of the world to support global peace and prosperity. Deployed Dutch personnel rely on GLOBECOMM for communications back home. GLOBECOMM networks enable them to talk and email friends and families and even partake of video teleconferences for holiday gatherings. • U.S. Department of Defense (DoD): Unfortunately, everyone is aware of the global threat of a multitude of terrorist activities around the world. GLOBECOMM is supporting the “war on terror” through partnering with various entities within the DoD, providing a wide array of our products and services. GLOBECOMM has more than 15 projects, tasks and contracts in which it is providing important, and in many cases, unique solutions that have been critical to the success of the DoD missions. • Afghan Telecom (AFTEL): AFTEL is the telephone company in Afghanistan appointed by the Afghan Ministry of Communications to provide telecommunications services throughout the country. One of its largest networks in the Village Communications Network, a 1200-site VSAT network that provides basic telephony services to the most remote and rural locations throughout the country. Government and military organizations require a communications provider to take an acid test to assess its ability to deliver data accurately and securely to the most difficult and hazardous areas in the world. Through a total solutions orientation, global network and engineering superiority, GLOBECOMM has consistently demonstrated the ability to deliver remote communications connectivity under the most trying circumstances. Provisioning of networks and associated equipment and services takes program management rigor as well as an overall strategic perspective in terms of having the correct equipment, appropriate access to various satellite operators and trained, agile field engineering teams.